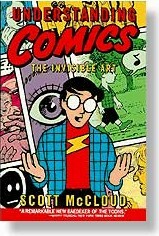 Book log of Understanding Comics: The Invisible Art. "Juxtaposed pictorial and other images in deliberate sequence intended to convey information and/or to produce and aesthetic response in the viewer." prohibition of any materials or tools. limitations of genre, subject matter, or style. Presumably, then, a haiga sequence could be a comics! a single image, which he says is a cartoon but not a comics. After an enthusiastic bounce through history, to pre-Columbian manuscripts, to the 11th century European Bayeux tapestry, to the Egyptian sequences of words and images over 32 centuries ago (such as at the tomb of the scribe Menna). Icon: 'Any image used to represent a person, place, thing, or idea'. Combination of 'iconic characters with unusually realistic backgrounds ... allows readers to MASK themselves in a character and safely enter a sensually stimulating world'. Characters drawn more realistically are 'objectified'. Words as the 'ultimate abstraction. The picture plane as a triangle with Reality at the left bottom corner, Language at the right bottom corner, and Picture Plane or Art Object at the pinnacle. The Picture Plane is 'where shapes, lines, and colors can be themselves and not pretend otherwise'. pp. 52-53: a large triangle where you see 116 different different styles imaged and annotated. The artist shown as most abstract is Mary Fleener. The triangle is extended to the right at the base by an additional short horizontal line, leading to a slightly wider triangle, presented like a pyramid seen from sand level. vary a lot in iconic content and little in iconic abstraction. vary a lot in iconic abstraction and little in iconic content. change throughout both iconic abstraction and iconic content. Closure: a comics shows parts of thing that the observer then perceives as the whole. The gutter: the space between the panels of a comics; our imagination takes the two images that boarder the gutter and transforms then into a single idea. Notice how the gutter in comics is similar to the pivot between two juxtaposed images in haiku. "If visual iconography is the vocabulary of comics, closure is its grammar." Experimental comics (such as early Art Spiegelman) explore all transitions. emphasizing 'being there' rather than 'getting there'. story telling as an art of intervals. greater focus on figure/ground relationships (see gestalt in cognitive psychology and 'negative space'. "Between panels, none of our senses are required at all. Which is why all of our senses are engaged." "If readers are particularly aware of the art in a given story then closure is probably not happening without some effort." Panel (or frame) "acts as a sort of general indicator that space and time is being divided". Duration of time and dimension of space is defined more by the contents than by the panel. But more length on a panel can indicate more time passing. A borderless panel can seem extended in time. "When the contents of a silent panel offers no clues as to its duration, it can also produce a sense of timelessness." This can be increased by letting a panel run off the edge of the page. Within a single panel, ways of showing motion include the "motion line" and "subjective motion". "The idea that a picture can evoke an emotional or sensual response in the viewer is vital to the art of comics." Direction, shape, and character of a line each can indicate emotion. Symbols for emotions (hearts, pain zigzags, star for dizziness, etc). The different icon of symbols in Japanese comics: bubble from the nose for sleep, blood(?) from the nose for lust, teeth and raised hair for anger, bean-shaped eyes for dementia. Other indicators of emotion: background; speech balloon shapes; lettering style. Pictures (resemblance) and words (meaning) moved apart for 50 centuries. And both are now exploring upward on the iconic abstraction chart, toward the abstract vertex. Different types of word-picture combinations include: picture-specific (words are a sound track to images); duo-specific (where words and pictures offer the identical message); additive (words amplify an image, or an image amplifies words); montage. The most common word-picture combination is the "independent" combination: word and pictures convey an idea that neither could alone. Each supports the other. Again consider how a haiku is greater than the two images that it juxtaposes. "Art ... is any human activity that doesn't grow out of either of our species two basic instincts: survival and reproduction." idea or purpose; impulses and ideas; the content of the work. To contribute at this level, one explores ideas, "then his art becomes a tool". form. To contribute at this level, one explores all that the art form is capable of: "His art would BECOME his purpose and the ideas would arrive in time to give it substance." Pioneers and revolutionaries. idiom or school of art: "the vocabulary if styles or gestures or subject matter, the genre that the work belongs to ... maybe a genre of its own." To contribute at this level, one needs "to invent new ways of showing 'the same old thing'" and eventually start "doing away with 'the same old thing' altogether". structure: organization of the work; what to omit as well as what to include. For this level, one needs to see the whole picture ("pacing, drama, humor, suspense, composition, thematic development, irony") beneath the crafts of draftsmanship and scripting. craft: construction by "applying skills, practical knowledge, invention, problem-solving". A well educated student can do this. surface: production values; the aspects that an audience first perceives. A beginner can do this. Erratic relationship between comics and color is "summed up in two words ... commerce and technology". Initially American comics in primary colors, averaging out to grey. "When used well, color in comics can -- like comics itself -- amount to far more than the sum of its parts.